Family meals offer a smorgasbord of benefits for families. For instance, children whose families enjoy regular family meals earn higher grade point averages. 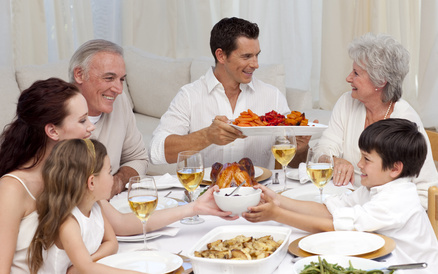 Regular family meals contribute to lower rates of substance abuse, teen pregnancy, and depression in adolescents. Dinner conversations boost vocabulary more than reading. And, stories of personal victories, perseverance, and fun moments shared at dinner build children’s resilience and confidence. In spite of all these benefits, family meals are difficult to arrange. In our fast-paced culture we tend to gorge our families with individual activities and fast food instead of savoring the time invested in a family meal. Perhaps we can copy a recipe from the French when it comes to valuing both food and our families. In How Eskimos Keep Their Babies Warm, Mei Ling Hopgood takes one chapter to describe how the French teach their children to love healthy food. Let’s chew on three ingredients the French savor when it comes to family meals. Mealtime is a sacred time, a time set apart from the busy-ness of life. Like all sacred times, the family meal is approached with anticipation. Ingredients are chosen with care and thoughtfully prepared in love. The family takes time to savor the uniqueness of each ingredient as well as the dynamic blend of flavors and aromas they create. With this mindset, the meal becomes a sacred moment which the whole family can admire and share. Mealtime is an expression of love. Meals allow us to promote our families’ physical health by choosing quality foods and our families’ emotional health in the secure bonding we enjoy over food. As an expression of love, mealtime becomes more than simply filling our bodies with nutrients. It becomes an opportunity to give other family members their favorite foods, to humbly serve one another, and to express gratitude for what we have received. During mealtime, we can offer our children or spouse the first bite and make the small, loving sacrifice of offering the last bite as well. Mealtimes are family projects. Everyone can pitch in from the very beginning. The whole family can help obtain the foods, whether by carefully choosing and purchasing the food at the grocery store or by growing and picking the food from the garden. The whole family can also participate in cooking the food, preparing the table, and cleaning the dishes. Throughout the process, family members can enjoy conversation and laughter. Most importantly, the whole family can sit down to eat the “fruits of their labor” together, presenting a wonderful opportunity to remember, give thanks, and celebrate the sacred moment of a family meal, prepared and shared in love by the whole family. Enjoy the benefits of the sacred mealtime by joining me in the family mealtime project. As we start the new year, commit to eating at least three meals each week as a family. No TV. No scattering each one to his own room. No cell phones. Just you and your family cooking up the perfect family recipe and enjoying the sacred expression of love we call mealtime. Join me in Project Mealtime: A Sacred Expression of Love.